When Becky Peters arrived at Rose Hill in the fall of 2008 for her freshman season, she was joining a storied program that had fallen on some hard times—at least on the court. The transition a decade earlier to the Atlantic 10 had been a rough one, and the perennially strong squads had hit rock bottom, a winless season the year prior capping 13 straight losing marks. 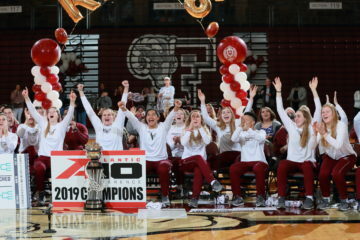 By the time she left after four stellar seasons, Peters played her way into the Fordham record books and was part of Coach Stephanie Gaitley‘s first squad, the one that set the foundation for the heights it has achieved since. 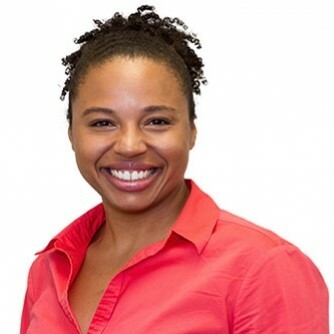 A West Windsor-Plainsboro South High School product, Peters graduated with a degree in Business Adminstration (Finance) before earning her Master of Science in Accounting, also at Fordham. She scored 1,318 career points, including 155 three point goals, both top 10 marks in school history. In the 2009-10 Fordham Basketball Media Guide, she answered a question about where she would see herself in 10 years with: “An established business woman … living the New York City area.” Today, less than a decade later, she’s a Financial Consultant at New York-based Charter School Business Management (CSBM), living not too far from campus in the Bronx. She took a few minutes out of her hectic schedule to talk about her Fordham experience. Rebounders Club: As a player, you were one of those born leaders. 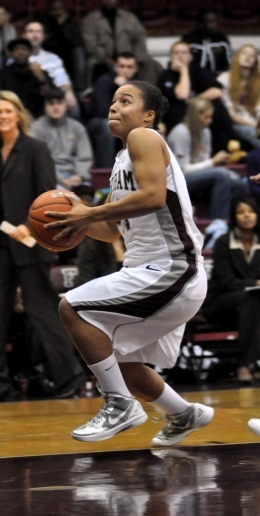 What did playing basketball at Fordham do for you that you’ve used moving forward? Becky Peters: So many things. I still use Basketball analogies to this day! I’ve learned so much about leadership, teamwork, people, etc by playing basketball, especially at a high level. I really wonder how people learn about these skills without being a part of a college team. I’ve learned how to lead and how sometimes that means being quiet and taking a back seat. I’ve learned that it takes a team no matter what you’re doing. I’ve learned how to handle pressure. I’ve always been the one that people look to when there’s 10 seconds left on the clock and we need a bucket. This experience has made me very comfortable when the pressure is on. RC: The teams you were on laid the foundation for the success the team enjoys today. How much pride to you take in having played a part in that? BP: A lot. 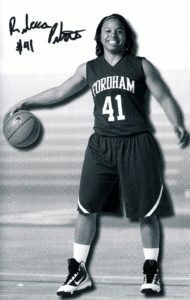 I love getting the opportunity to talk about women’s basketball, especially the Fordham program. RC: You were remarkably consistent over your four years, averaging double figures every year, and you’re in the top 10 in scoring all time at Fordham. To what do you attribute that consistency? BP: Really? I thought the one thing I could’ve worked on more is consistency! A lot of that has to do with team. I could not have been a better player if my teammates weren’t going their hardest in practice. I had great teammates that also held me accountable. Touch the lines and get every rep.
RC: What are some memories of your time off the court at Fordham? BP: A lot of fun! 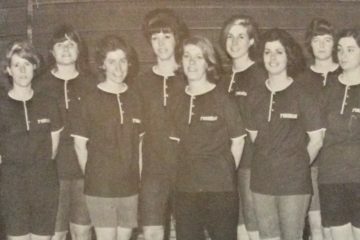 We worked very hard on the court and off the court we were a great group of women. We roomed, ate, traveled, studied and went out together. RC: Do you keep in touch with some of your teammates, and do you get back to campus for games often? BP: It’s amazing how much effort it is to maintain relationships after leaving college. Before, you’d show up to the Cafe every day and you’d see at least one of your friends there. Nowadays, it takes a lot of scheduling just to share a meal together! So I do keep in touch, of course not as much as I would like. In terms of getting back to campus, I’ve actually been terrible at that. While I do live in The Bronx, on the weekends, I’m trying to do all the things that I can’t do during the week! So it’s hard, but I’m going to make a better effort this year! RC: What has the whole Fordham experience meant for you in your life? BP: Fordham has been amazing for me. 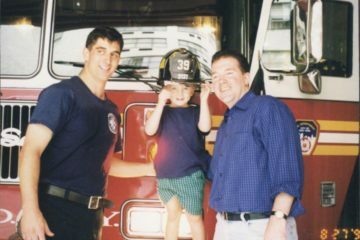 It’s in New York City, it allowed for my family to come to nearly all the home games and be a part of my college, the business school offered so many opportunities, I met amazing people and I have wonderful memories that no one can take from me. Fordham allowed me to grow and learn in a safe and challenging environment.